We did the 2018/2019 New Year's Eve cruise to New Zealand. Couldn't have asked for more. Food, staff, entertainment all amazing. Ship was looking a little tired in places but was clean & comfortable. Sad that she is leaving the fleet in March. Pacific Jewel is amazing. The staff are so incredibly kind and genuine, they feel like family. Most of the entertainment is really good and sure the ship is slightly older but a holiday is what you make of it. The room was much more spacious then I predicted and the ship is always spotless. There were heaps of free activities for every age group as well as for the whole family. Loved every second of it and even during rough water the staff checked on us to make sure we were okay. There's been so many bad reviews of this ship and I can't figure out why. I loved it. We now know why it took us so long to go on a cruise, we had heard all the stories from friends and family as well as neighbours, talking it all up and saying how wonderful cruises were to go on. We fail to see what all the fuss and hoopla is all about. We think cruises are equal to spending 8 nights trapped in your local bloody RSL club. Overrated ! We found the Jewel to be an adequate ship. A bit tired but still well maintained. The mini suite was very comfortable. As we expected there wasn't much in the way of activities but we are not looking for waterslides and bumper cars. The entertainment crew were excellent so we were never bored. The food in both the pantry and the waterfront was ok but nothing to rave about. Overall we had a lovely holiday at a great price. 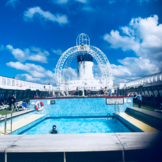 I had very low expectations for our 4 night cruise after reading a number of poor reviews for this cruise and P&O in general. A few people said words to the effect of "if you haven't been with another cruise line, for example Royal Caribbean, then you won't know any better and it will be fine". Well, we had previously cruised with RCI and I'm pleased to report that we still found the cruise fine. Was the service outstanding? No. Was the food amazing? No. Where we overwhelmed with the choice on onboard activities? No. Did we have a good time? Yes. Was the service adequate? Yes. Was the food ok? Yes. Did we find enough to do to occupy our time? Yes. The ship's decor looked outdated, although some might call it 'retro'. Plenty of orange & brown hues. The food was just ok. The pantry served up a variety of styles of food and we could always find something we liked although I wouldn't have wanted to eat there for much more than 4 days. The Waterfront restaurant was a little disappointing with the food well below the quality we found on RCI but it was still fine. 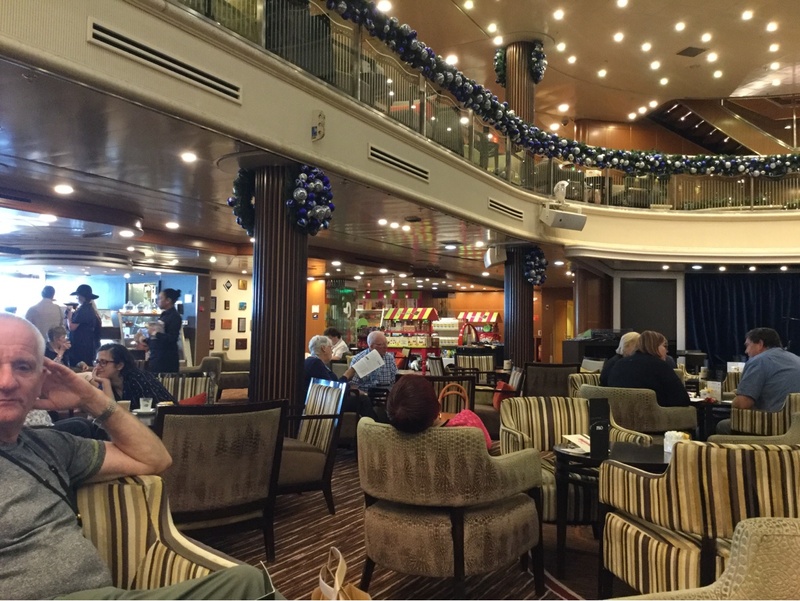 My husband even felt that the espresso coffee was better on P&O compared to RCI! The kids club was good. Miss 4 went along for a short time each day & enjoyed her time there. 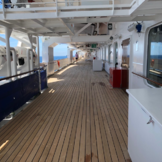 We probably wouldn't choose to sail with P&O again unless friends were going or there was a particularly enticing itinerary but it wasn't that bad, just not particularly special. Went on our first cruise on the Jewel. Was nice but not a lot to do. Staff were very friendly, but my husband and I found that we were bored. We hit rough weather which didn't help either and saw decks closed. Food in the pantry was ok, but waterfront was lovely, we enjoyed eating there. Look not for us I don't think, but great if u want to do nothing or are interested in bingo, trivia and ballroom dancing. Pacific Jewel very boring on food selection & repeats on meals in The Pantry. Entertainment Shows too much comedy. Long waits on Lifts, Found the Ship too small, Table availability on Activities around, specially on sea days. Staff not as friendly as other cruise lines. Tendering passengers off, too slow. Queues. Very average overall, prepared to other cruiselines. Just finished a 4 night cruise from Sydney to Moreton Island on the Pacific Jewel. This was my 1st cruise. Here goes! This ship could do with an update. Balcony is not worth the money. Cabin 10205 and bathroom is very small and water flow in shower was terrible. Pantry food was basically food court food. Waterfront restaurant was much better. Staff were quite friendly. Not a bad experience but I have heard other ships offer a lot more overall. Bottom line - a bit disappointed but was in good company (14 of us) so didnt bother us too much. Don't think I will do P&O again though. Not terribly impressed. Older ship, few facilities of not great quality. Things that are free in other lines cost on this, such as ice cream, pizzas, burgers, room service. Pools are plain, very difficult for elderly or disabled to access, and usually completely monopolised by kids. Ditto with the spa pools. Atrium isnt actually an atrium, is only on 3 levels, has only one bar on 2nd level, but main seating area is Level below! The Pantry is poorly laid out, leading to long queues and cold food. However, crew are great, activities many, shows fantastic. I've just returned from an 8 night cruise to Eden (missed port due to bad sea) Mornington, Portland and Kangaroo Island then back to Sydney. The Jewel is past her use by date, P&O tend to give us the ships prior to them leaving the fleet and whilst Jewel has been in Aus for years it's time to go. Food was VERY average - The Pantry over rated as was Waterfront that had reparative menus - had to actually pay to have a steak. My cabin whisky clean was aged and worn. Entertainment was mostly paid for with the general quizzes and nightly shows which lacked real punch. Things that are included on other cruise lines are charged for on P&O which is a real shame. Coke was only in some bars some days but everywhere had Pepsi which show budget and cheap. I've just completed the email survey and it's hard to find a posture apart from some ports to write. I'd suggest try RCI for inclusiveness which is a shame as I've cruised many times with P&O but never again. Staff were a bit rude, very unorganised, nice cabin really spacious and clean, food was average, checkin was so slow, disembarkment was very slow and so unorganised. I went on this ship this year and it was pretty good. It had great activities such as the zip line, layer tag and a bouncy of other things. The kids club helped me interact with others and kept me entertained all day. I loved the renovations when we sailed on the Jewel, they did a stellar job with the public areas. What let down the experience for me was the staff. I understand that the crew work extremely long shifts for months on end, however a smile wouldn’t go astray. The service was really lacking. One more thing, the coffee was AWFUL! My gosh we weren’t impressed with it at all. After paying for our brew at the cafe a few times, hubby and I figured we were better off just having the free stuff from the buffet. This was our first ever cruise in June 2013 and we were not disappointed. She was a beautiful ship in her day, not too many people, not too big, not too flashy, But amazing all the same. It is definitely her fault that we fell in love with cruising and realised that cruising isn't just for old people!